As the silly season commences; more and more people will be looking to have 'date night' on the cheap. Or catch up with friends… but again on the cheap. Presents, holidays, Christmas parties all add up. Luckily; the bar-cinema trend is growing and now several bars spanning Sydney's North, East and West offer movie nights. Roll on in, settle into your seat with a schooner and some snacks and enjoy these free flicks for a fraction of what you would have paid for 'dinner and a movie' in the traditional sense. The Bridgeview Hotel in the North Shore suburb of Willoughby has completed renovations earlier this year and now boasts a revamped, classy dining room alongside their main bar. Enjoy an early meal from the new menu as the last of the summer evening light streams in before retreating to the bar for a 8pm cinematic kick-off every Tuesday evening. Free popcorn is provided to accompany the old-school flicks that are shown but our tip is to arrive early and enjoy the happy hour drinks between 5 & 7pm, although not to worry if you miss it... lady's cocktails are very reasonably priced at only $12 all day every day. Click here for more information. Sydney's favourite hotdog bar, Sodafactory made a niche for itself in the semi-small bar arena by offering a weekly film night when it first entered the market. Fast forward multiple months and the patrons still flock thick and fast on Mondays for their free film night (as well as Tuesdays for $1 dawg night). With drinks at only $5 (7-9pm) and free popcorn served when the flick commences at 8pm... you wont get a better deal for a drink, a snack and a flick in a trendy candle-lit setting! Click here for more information on movie line up. The beautiful Beresford in Surry Hills, one of everyone's favourite beer gardens, plays host to the beautiful young trendsetters on Mondays at 7.30pm when the back garden transforms into an outdoor cinema. Sip champagne (or sparkling) under the stars and enjoy the movies put on each week according to the theme of the month. What a way to avoid Monday-itis! On special to accompany the Monday flicks are pastas and lasagnas served with a glass of red so this is definitely a wallet friendly night out. As a heads up boys, February is Love & Cheese month and whilst Valentines day does not fall on a Monday why not score extra points and put the 10th or 17th in your diary… Every girl loves Dirty Dancing. It seems impossible to write a list about trends without including a bar, café or restaurant from the Newtown area. Chippendale's Marmalade Bar, upstairs at The Rose on Cleveland Street leads the charge on Wednesdays showing free films according to the subject or theme of the month. With free popcorn and cocktails on special for only $9 this could definitely be one of your cheapest nights out each week!. What's nice as well is that they start the film early at 7pm meaning those who are feeling a little weary on hump day can hit the hay nice and early to replenish yourself for the rest of the week. To see what will be showing each week check their facebook page. If you prefer to watch your film with only a few others, the Newtown Hotel's vintage movie nights will definitely appeal. 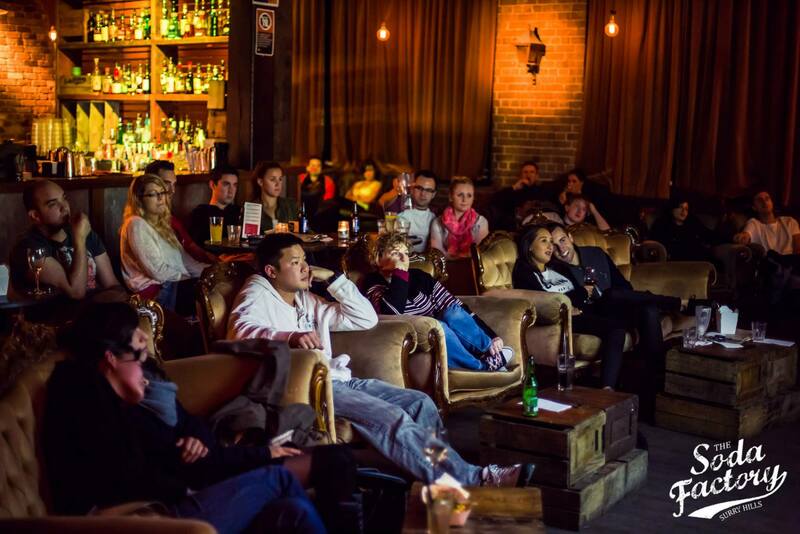 Each Tuesday, 18 patrons are able to experience an old-school film in the comfort of Newtown Hotel's very own cinema. As seats are few, the mantra is 'first in first served' so be prepared to arrive early or miss out. Kick off is 7pm, free popcorn is served and traditional choctops along with a few novelty flavours (think apple pie, passionfruit etc) are available for purchase. Thrilling and delighting those who live along Parramatta Road, Deus Café will thrill and delight you with their Monday movie evenings. Films show between 7.30 & 9.30pm. What's nice about this venue is that it is a café rather than a bar, so depending on the film you might even want to bring the older children. What can you eat? What can you fit! $15 will buy you all you can eat to accompany the film so make sure you keep the pants loose or stretchy!